Sarunas Nejus has been working at Caterva GmbH in Germany this summer as an Energy Storage Systems Hardware Engineer. He tells us what he's been up to. "I am responsible for the hardware of solar energy storage systems, which, apart from the conventional features they have (energy for household users etc. ), being connected to a swam, provide/sink charge to/from the grid in Europe when it is needed (for instance, sudden shut off of a power plant). That is called frequency stabilisation and our systems do it in quite a novel way, thus it’s very exciting to work here. One of the things that attracted me here was that the company is a start-up (you know how things are going in start-ups, don’t you?). "I’m working on a whole lot of various tasks, which do not only include my subject – that makes things even more interesting. The company’s culture is great – as that is a start-up, every door is open and everyone’s ready to help. I’ve actually been enjoying the first month here very much – troubleshooting different hardware problems, designing improvement circuitries for the device and even visiting our customers all across Bavaria for maintenance cases. Although I’ve been here for a very small amount of time, I was swept to the team’s culture so quickly that I feel like I’m senior here already. The communication between the team members is outstanding, including daily huddle sessions and I also have my role defined clearly, I know where the company is moving, its visions and what sort of impact I can make. "I must mention that the company’s CTO, who is our main manager, is actually the best leadership example I have ever seen in reality. This guy leads by example, even though he always has a great workload to do himself, he is always ready to help anyone with any struggle. All of the company aims are made clear, everyone’s updated about everything that everyone’s been at during daily huddles (what I’ve been at, what I plan to do and what I’m struggling with), and now, experiencing it myself, I can say that this sort of communication is effective and motivating as never. One can notice that assertive communication between each other, a right mixture of work effectiveness and people satisfaction brings unbelievable results considering that the team is so small. 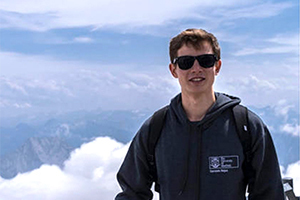 "By the end of the placement (13 months overall) I want to expand my knowledge not just in renewable energy systems hardware but also in its business side, to be aware of what Europe needs and what problems are occurring. The first month looked very promising and I have no doubts that subsequent time here in Caterva will be no less exciting than it’s now."